According to a new report from the World Bank, the global economy is strengthening, rebounding from recent challenges and assisted by better manufacturing and export data. It sees world GDP growing 2.7 percent and 2.9 percent in 2017 and 2018, respectively, up from 2.4 percent in 2016. In the United States, the World Bank predicts 2.1 percent and 2.2 percent growth in 2017 and 2018, respectively, up from 1.6 percent in 2016. In the emerging and developing economies, it predicts growth increasing from 3.5 percent to 4.1 percent to 4.5 percent from 2016 to 2018. As such, the outlook in June changed little from its January release. The underlying message is that the international economy appears to have turned a corner—especially when compared to the headwinds over the past few years—and is headed in the right direction. At the same time, the World Bank notes that political uncertainty, particularly regarding trade, could pose downward risks to these projections. Much of the recent data released in the past few weeks tend to support the notion that the global economy has improved, even as several indicators showed some slippage in sentiment in May. For instance, the J.P. Morgan Global Manufacturing PMI continued to expand at a decent pace, even as the headline number has pulled back slightly from March’s nearly six-year high. The sector essentially stagnated one year ago, illustrating the progress since then. In May, all but two of the top-15 markets for U.S.-manufactured goods exports experienced growth in their manufacturing sectors. As recently as August, seven of those markets contracted, providing further evidence of current progress. With that said, China returned to contraction territory for the first time in 11 months in May, and South Korea—a country that has grappled with major political challenges of late—also saw its manufacturing sector decline once more. Meanwhile, even before the results of the United Kingdom election are known later today, Europe has continued to dominate the list of the top export markets with strong manufacturing growth, including Germany, the Netherlands and the United Kingdom. Indeed, the IHS Markit Eurozone Manufacturing PMI rose to its best reading since April 2011 with stronger growth across the board. Real GDP in the Eurozone accelerated to 0.6 percent growth in the first quarter, its fastest pace in two years, or 1.9 percent at the annual rate. At the same time, manufacturing production expanded 0.4 percent in April, or 2.6 percent year-over-year. For its part, retail sales rose for the fourth consecutive month, edging up 0.1 percent in April. Over the past 12 months, spending has risen 2.5 percent, continuing an accelerating trend. Those positive economic signs could help explain how the unemployment rate in April fell to 9.3 percent, its lowest level since March 2009. Similar to what we see in Europe, Canada—our largest trading partner—has also seen notable improvements in its economy. The IHS Markit Canada Manufacturing PMI remained strong in May despite pulling back from a six-year high in April. Real GDP grew 0.9 percent in the first quarter, picking up from the 0.7 percent gain in the fourth quarter. That translated into 3.7 percent growth at the annual rate in the first quarter, with consumer spending as well as business spending boosting the Canadian economy. In addition, manufacturing sales in Canada increased 1.0 percent in March, rebounding from the decline of 0.6 percent in February. Most impressively, sales in the sector have jumped 8.2 percent year-over-year. Similarly, retail spending also bounced back, improving from a decrease of 0.4 percent in February to an increase of 0.7 percent in March, with year-over-year growth of 6.9 percent. With the global economy trending in the right direction, U.S.-manufactured goods exports have improved so far in 2017—a welcome development after weaker data in each of the past two years. Using non-seasonally adjusted data, U.S.-manufactured goods exports totaled $353.09 billion year to date in April, up 3.44 percent from $341.33 billion one year ago. Yet, even with encouraging news, there continue to be lingering headwinds. The U.S. trade deficit rose to a three-month high, and the dollar remains strong, up 21.4 percent since June 2014 against major currencies. 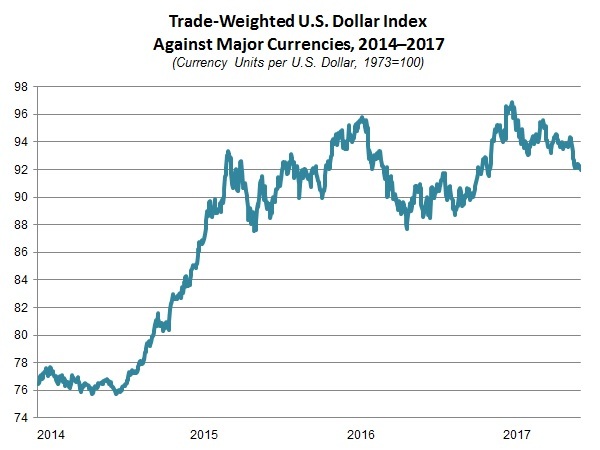 (To be fair, the U.S. dollar has depreciated 4.0 percent year to date.) This makes it more difficult for manufacturers in the United States to increase international demand. In addition, as noted above, there are also ongoing uncertainties in the policy environment. Along those lines, the administration formally notifies Congress of intention to renegotiate the North American Free Trade Agreement (NAFTA), which could start as early as August 16. Manufacturers travel to Cuba to review opportunities and challenges. The U.S. International Trade Commission (USITC) is readying its report on a new Miscellaneous Tariff Bill (MTB), while Congress considers new sanctions legislation. The administration issued results from its 100-day plan with Congress, and the new NAM-led coalition on global institutions expands and issues letters and a new poll on the importance of U.S. leadership. Global manufacturing continued to expand at a decent pace. The J.P. Morgan Global Manufacturing PMI edged down from 52.7 in April to 52.6 in May. Even with the headline number growing at its slowest rate since November, the international economy is expanding at a pace not far from what was seen in March (53.0), which was the fastest rate since May 2011. As such, even with some easing, the international economic environment continues to grow modestly, with notable improvements over the past 12 months. One year ago, for instance, the headline number essentially stagnated (50.1). The underlying data in May mostly reflected softer—but still reassuring—growth. There were marginally weaker expansions for output (down from 53.6 to 53.5), exports (down from 52.5 to 52.3) and employment (down from 51.6 to 51.5), with growth in new orders flat (unchanged at 53.6). In addition, the index for future output remained quite elevated, even while declining from 64.6 in February—a two-year high—to 63.5 in May. This would seem to indicate healthy gains moving forward. Meanwhile, Europe continued to dominate the list of the top export markets with strong manufacturing growth, albeit with some easing in some of the latest surveys. Those countries with the highest PMI readings in the sector in May included Germany (up from 58.2 to 59.5), the Netherlands (down from 57.8 to 57.6), the United Kingdom (down from 57.3 to 56.7), Canada (down from 55.9 to 55.1) and the United Arab Emirates (down from 56.1 to 54.3). Activity in Germany expanded at its quickest pace in 73 months, and data for Great Britain remained strong despite some political uncertainty surrounding today’s (June 8) election. Manufacturers in the Eurozone reported their best growth rates since April 2011. The IHS Markit Eurozone Manufacturing PMI increased from 56.7 in April to 57.0 in May, a 73-month high. Activity was mostly higher across the board, including strong growth for new orders (up from 57.7 to 57.8), output (up from 57.9 to 58.3), exports (up from 57.4 to 57.5) and hiring (up from 55.5 to 56.1). The pace of employment growth was the fastest in the survey’s 20-year history. Respondents remained very upbeat about output over the next six months despite some easing in the latest report (down from 66.8 to 66.0). As noted earlier, many of the best PMI readings globally occurred in Europe, showing just how much the continent’s economies have turned a corner. Helping to buoy the headline number, Austria (down from 58.1 to 58.0) and Germany (up from 58.2 to 59.5) were at or near six-year highs. At the same time, France (down from 55.1 to 53.8), Ireland (up from 55.0 to 55.9), Italy (down from 56.2 to 55.1), the Netherlands (down from 57.8 to 57.6), Spain (up from 54.5 to 55.4) and the United Kingdom (down from 57.3 to 56.7) also experienced healthy expansions in activity even with some of these markets slowing slightly in May. Hiring in Spain grew at its quickest clip since July 1998. In contrast to those markets, Greece contracted for the ninth straight month (up from 48.2 to 49.6) but stabilized somewhat in both April and May, with employment rising for the first time since November. Real GDP in the Eurozone accelerated to 0.6 percent growth in the first quarter, its fastest pace in two years and up from 0.5 percent growth in the fourth quarter. That translated into 1.9 percent growth at the annual rate. We will get new industrial production data for April on June 14, which it is hoped will show a rebound from the 0.1 percent decline seen in March, mainly on reduced mining and utilities output. Despite the slight decrease, industrial production has increased 1.9 percent over the past 12 months. At the same time, manufacturing production expanded 0.4 percent in April, or 2.6 percent year-over-year. For its part, retail sales rose for the fourth consecutive month, edging up 0.1 percent in April. Over the past 12 months, spending has risen 2.5 percent, continuing an accelerating trend. Meanwhile, the unemployment rate in April fell to 9.3 percent, its lowest level since March 2009. Canadian manufacturing grew strongly in May despite pulling back from a six-year high in April. The IHS Markit Canada Manufacturing PMI decreased from 55.9 in April—a level not seen since April 2011—to 55.1 in May. Despite the easing, the economy has made significant progress since essentially stalling in September (50.3). In May, expansions slowed for new orders (down from 57.6 to 55.7), output (down from 55.8 to 54.3) and employment (down from 56.1 to 55.4), but exports accelerated somewhat (up from 52.6 to 53.3). The deceleration in sentiment was fairly widespread, with weaker growth in Alberta and British Columbia (down from 57.3 to 55.8), Ontario (down from 54.1 to 53.0) and Quebec (down from 55.9 to 55.4). With that said, the measure for the rest of Canada inched higher for the month (up from 55.0 to 55.5) on better demand and production figures. Real GDP grew 0.9 percent in the first quarter, picking up from the 0.7 percent gain in the fourth quarter. That translated into 3.7 percent growth at the annual rate in the first quarter, with consumer spending as well as business spending boosting the Canadian economy. In addition, manufacturing sales in Canada increased 1.0 percent in March, rebounding from the decline of 0.6 percent in February. Most impressively, sales in the sector have jumped 8.2 percent year-over-year. Similarly, retail spending also bounced back, improving from a decrease of 0.4 percent in February to an increase of 0.7 percent in March, with year-over-year growth of 6.9 percent. Meanwhile, new labor market data for May will be released on June 9. In April, the unemployment rate dropped to 6.5 percent, its lowest level since October 2008. For their part, manufacturers lost 600 workers in April, with a year-over-year increase of 800 employees. In essence, employment in the sector changed little over the past 12 months. Mexican activity rebounded slightly in May but remained subpar. The IHS Markit Mexico Manufacturing PMI rose from 50.7 in April to 51.2 in May. That represents marginal progress, but with a six-month average of 50.8, it is also clear that manufacturing activity in Mexico continues to expand quite slowly. On the positive side, activity was higher across the board in the latest survey, including new orders (up from 51.8 to 52.1), output (up from 49.7 to 50.7), exports (up from 51.8 to 52.7) and employment (up from 50.6 to 51.2). Future output was another bright spot (up from 70.1 to 75.1), with that measure increasing at its fastest pace since April 2016. This would indicate strong gains in production over the next six months. Real GDP increased 2.8 percent year-over-year in the first quarter, its best reading since the third quarter of 2015. New industrial production data for April will be released on June 12. In March, industrial production rebounded from a decline of 1.9 percent year-over-year in February to a gain of 3.4 percent. Manufacturing output also accelerated strongly, up from 1.3 percent growth year-over-year in February to 8.5 percent in March. It was the fifth straight monthly expansion in manufacturing production. Meanwhile, the unemployment rate ticked up from 3.2 percent in March to 3.5 percent in April. However, this was lower than the 4.1 percent rate in September. Chinese manufacturing activity contracted for the first time in 11 months. The Caixin China General Manufacturing PMI declined from 50.3 in April to 49.6 in May, indicating falling conditions for the month and a turnaround from recent progress. Indeed, all of the key indicators moved lower in May, including new orders (down from 50.9 to 50.3), output (down from 51.0 to 50.2) and exports (down from 50.7 to 50.2). Note that all three of those measures saw marginal gains in activity for the month, even with the easing. In contrast, employment continued to weaken once again (down from 47.8 to 47.6), much as it has every month since October 2013. The index for future output signaled modest growth moving forward (unchanged at 56.9), despite slowing from February’s fastest pace since May 2015 (60.3). It is worth noting that official data do not reflect a contraction in activity in the sector. The National Bureau of Statistics of China’s Manufacturing PMI was unchanged at 51.2 in May, down from 51.8 in March but expanding for the 10th consecutive month. The Chinese economy grew 6.9 percent year-over-year in the first quarter, accelerating from 6.7 percent in the third quarter and 6.8 percent in the fourth quarter. This is further proof that its economy has turned the corner somewhat, even as we continue to see decelerated activity in China from more robust expansions in prior years. With that said, industrial production slowed in the most recent data, down from 7.6 percent year-over-year in March to 6.5 percent in April. That was still better than the 6.0 percent reading in December. There were similar trends for fixed-asset investment (down from 9.2 percent year-over-year to 8.9 percent) and retail sales (down from 10.9 percent year-over-year to 10.7 percent), both of which softened in April. Japanese manufacturing continued to expand modestly in May. The Nikkei Japan Manufacturing PMI rose from 52.7 in April to 53.1 in May, its best reading since February and the ninth consecutive expansion. The underlying data were mixed. New orders (up from 52.4 to 53.4) and output (up from 53.4 to 54.0) strengthened in the latest survey, but exports (down from 53.3 to 53.0) and employment (down from 53.6 to 53.4) both slowed somewhat. Looking ahead, the index of future output continues to reflect a mostly upbeat assessment of the coming months (down from 61.7 to 60.6), even with some easing in that measure. Real GDP increased 0.5 percent in the first quarter, its strongest pace since the first quarter of 2016. On a year-over-year basis, that translated to 1.6 percent growth. Looking specifically at manufacturing, industrial production rebounded strongly, up 4.0 percent in April after falling back by 1.9 percent in March. The longer-term trend remained favorable, with industrial production up 5.7 percent since April 2016. Manufacturing activity in the emerging markets expanded at its weakest pace in May since September. The IHS Markit Emerging Markets Manufacturing Index declined from 50.8 in April to 50.5 in May but expanded for the 11th consecutive month. As such, conditions in the emerging markets softened slightly even as the overall trend reflects some stabilization and general improvements from a year ago. In May, growth decelerated for new orders (down from 51.6 to 51.4), output (down from 51.6 to 51.3) and exports (down from 50.8 to 50.6). At the same time, employment continued to contract (down from 48.8 to 48.7). More favorably, the forward-looking index for future output ticked higher (up from 61.8 to 61.9), continuing to suggest a relatively healthy outlook moving ahead. The country-by-country data were mixed. Brazil (up from 50.1 to 52.0) and Hong Kong (up from 50.5 to 51.1) expanded for just the second straight month, with both growing in May after contracting for much of the past two years. The Brazilian PMI figure had its best reading since February 2013. In addition, Myanmar (up from 52.0 to 52.9), Nigeria (up from 53.6 to 54.4), the Philippines (up from 53.3 to 54.3) and Russia (up from 50.8 to 52.4) each reported stronger activity in May, with Nigeria citing a 17-month high. At the same time, a number of other emerging markets reported weaker data, including the Czech Republic (down from 57.5 to 56.4), India (down from 52.5 to 51.6), Poland (down from 54.1 to 52.7), Saudi Arabia (down from 56.5 to 55.3), South Africa (down from 50.3 to 50.2), Taiwan (down from 54.4 to 53.1), the United Arab Emirates (down from 56.1 to 54.3) and Vietnam (down from 54.1 to 51.6). Vietnamese sentiment slid to a 17-month low. In contrast, Kenya (down from 50.3 to 49.9) and Malaysia (down from 50.7 to 48.7) both returned to negative territory in May on reduced output. Other emerging economies with contracting manufacturing sectors for the month included Egypt (down from 47.4 to 47.3), Lebanon (down from 47.5 to 46.6) and South Korea (down from 49.4 to 49.2). U.S.-manufactured goods exports have improved so far in 2017. For manufacturers, exports have trended in the right direction in the early months of this year—a welcome development after weaker data in each of the past two years. Using non-seasonally adjusted data, U.S.-manufactured goods exports totaled $353.09 billion year to date in April, up 3.44 percent from $341.33 billion one year ago. This reflects better year-to-date figures in five of the top-six markets for U.S.-manufactured goods: Canada (up from $87.23 billion to $89.67 billion), Mexico (up from $74.69 billion to $77.57 billion), China (up from $33.86 billion to $39.34 billion), Japan (up from $19.72 billion to $22.01 billion) and Germany (up from $10.38 billion to $11.21 billion). The lone exception was a decline in U.S.-manufactured goods exports to the United Kingdom (down from $18.37 billion to $17.80 billion). The U.S. trade deficit moved higher in April. The U.S. trade deficit rose from $45.28 billion in March to $47.62 billion in April, a three-month high. The trade deficit has trended higher so far in 2017, averaging $46.65 billion per month year to date relative to $42.07 billion for 2016 as a whole. In April, the increased trade deficit was the result of reduced goods exports (down from $127.48 billion to $126.94 billion) and a pickup in goods imports (up from $193.54 billion to $195.32 billion). Interestingly, the petroleum trade deficit fell from $8.43 billion to $5.43 billion, its lowest level since September. Therefore, the uptick in April’s trade deficit primarily came from the nonpetroleum deficit, which grew from $56.50 billion to $61.71 billion, a level not seen since March 2015. Meanwhile, the service-sector surplus edged slightly lower, down from $20.78 billion to $20.77 billion. The underlying goods exports data were mixed. Exports in April increased for foods, feeds and beverages (up $582 million), industrial supplies and materials (up $429 million) and nonautomotive capital goods (up $19 million), but this was mostly offset by declining exports for consumer goods (down $720 million), automotive vehicles, parts and engines (down $532 million) and other goods (down $160 million). In contrast, goods imports saw larger shifts for the month, including significant decreases for industrial supplies and materials (down $1.47 billion) and automotive vehicles, parts and engines (down $673 million). Reduced petroleum imports were responsible for the decline in industrial supplies and materials imports. At the same time, consumer goods (up $1.94 billion), nonautomotive capital goods (up $933 million), other goods (up $731 million) and foods, feeds and beverages (up $370 million) each experienced higher goods imports in April. USTR sends letter to Congress notifying intention to renegotiate NAFTA. On May 18, U.S. Trade Representative (USTR) Robert Lighthizer sent a letter notifying Congress of the administration’s intention to renegotiate NAFTA. In the letter, Ambassador Lighthizer underscored that the administration “will consult closely with Congress in developing our negotiating positions to ensure that they are consistent with Congressional priorities and objectives” as laid out in Trade Promotion Authority (TPA). The NAM issued a press release in which NAM Vice President of International Economic Affairs Linda Dempsey said that “manufacturers are rolling up their sleeves to identify ways to modernize the 23-year-old NAFTA so the United States can be competitive in today’s global economy.” A number of key stakeholders issued statements on the letter, including House Ways and Means Committee Chairman Kevin Brady (R-TX) and Trade Subcommittee Chairman Dave Reichert (R-WA), Senate Finance Committee Chairman Orrin Hatch (R-UT), Senate Finance Committee Ranking Member Ron Wyden (D-OR) and New Democrat Coalition Chair Jim Himes (D-CT) and Trade Taskforce Co-Chairs Rick Larsen (D-WA) and Gregory Meeks (D-NY) as well as Canadian Foreign Affairs Minister Chrystia Freeland and the Government of Mexico. On May 23, USTR issued a Federal Register notice to request public comments by June 12 on negotiating objectives regarding the modernization of NAFTA with Canada and Mexico and also to announce a public hearing on June 27 at the USITC. Under TPA timelines, NAFTA negotiations with Canada, Mexico and the United States cannot begin until August 16, and the administration must release negotiating NAFTA objectives on USTR’s website by July 17 if it intends to begin negotiations on August 16. The NAM will submit detailed comments and will testify at the USITC on June 27. The NAM continues to work with its members, administration officials and Capitol Hill to grow the North American economy as a source of opportunity for manufacturers in the United States. For more information and to become involved in the NAM’s NAFTA work, contact Linda or NAM Director of International Trade Policy Ken Monahan. Manufacturers visit Cuba, senators introduce legislation to drop restrictions on trade and travel. A new economic impact analysis released last week estimated that a reversal of current Cuba policies would cost the U.S. economy $6.6 billion and affect 12,295 American jobs over the course of the first term of the Trump administration. In May, NAM President and CEO Jay Timmons led a delegation of manufacturers to visit with officials and entrepreneurs in Cuba. He shared his thoughts about that trip on Twitter and on the NAM Shopfloor blog. Recently, Sens. Jeff Flake (R-AZ) and Patrick Leahy (D-VT) reintroduced a bill that would allow Americans to travel to Cuba for tourism purposes. The bipartisan Freedom for Americans to Travel to Cuba Act of 2017 has 55 cosponsors. Sens. Amy Klobuchar (D-MN), Mike Enzi (R-WY), Flake and Leahy led a second bipartisan coalition of lawmakers to introduce the Freedom to Export to Cuba Act of 2017, which would eliminate the legal barriers to Americans doing business in Cuba. The Cuba policy review that is underway at the White House may result in a change to the current policy toward Cuba. To learn more about the NAM’s advocacy efforts on this issue, contact NAM Director of Trade Facilitation Policy Lauren Wilk. MTB process moves ahead with expected preliminary report to Congress. On June 9, the USITC will send a preliminary report to the Senate Finance and House Ways and Means committees on each of 2,598 pending MTB petitions that request the temporary elimination or reduction of U.S. import duties. This USITC report will include determinations on whether or not domestic production of petitioned articles exists and, if such production exists, whether or not a domestic producer of the petitioned articles objects to the duty suspension or reduction. The USITC’s preliminary report will also include any proposed technical changes to product descriptions that are necessary for purposes of customs implementation when the product is imported. The USITC report is required under the American Manufacturing Competitiveness Act of 2016, which established the MTB process. If you have any questions about the MTB process, contact NAM Director of International Trade Policy Ken Monahan. Senate considers new sanctions on Iran and Russia. The Senate is scheduled to consider this week the Countering Iran’s Destabilizing Activities Act of 2017 (S. 722). Sens. Bob Corker (R-TN), Ben Cardin (D-MD), Marco Rubio (R-FL), Tom Cotton (R-AR), Bob Menendez (D-NJ) and Bob Casey (D-PA) issued a joint press release after the Senate Foreign Relations Committee approved the bill. The State Department has continued to waive some sanctions against Iran, and Secretary of State Rex Tillerson certified in April that Iran was adhering to the nuclear deal. The Treasury Department announced simultaneously that it designated seven individuals and entities in connection with the missile program. In its recent mark-up, the Senate Foreign Relations Committee also approved the Countering Russian Influence in Europe and Eurasia Act of 2017 (S. 1221). While that bill does not impose or codify sanctions, it aims to counter Russia’s activities by strengthening cybersecurity, fighting corruption and bolstering democracy-building efforts. Sen. Cardin issued a statement after the mark-up to call on the committee to take up sanctions legislation this summer. If you need more information about this issue, contact NAM Director of Trade Facilitation Policy Lauren Wilk. WTO shifts to monitor implementation of the TFA. Earlier this month, the World Trade Organization (WTO) commemorated the milestone Trade Facilitation Agreement (TFA) with a seminar that highlighted the agreement’s innovation implementation mechanism, key factors of the negotiation that could serve as a model for future negotiations and the future of implementation. Concluded at the WTO’s 2013 Bali Ministerial Conference, the multilateral agreement entered into force in February 2017. The WTO’s Trade Facilitation Committee held its first meeting in May, where Sweden’s Daniel Blockert was elected chair of the committee. The committee will share best practices among members and will review the implementation of the TFA. To learn more about the NAM’s advocacy efforts on customs and trade facilitation issues, contact NAM Director of Trade Facilitation Policy Lauren Wilk. Commerce announces interim results from U.S.–China 100-day plan. On May 11, the Commerce Department announced interim results of negotiations toward the 100-day plan, a goal announced after the high-level summit at Mar-a-Lago between President Donald Trump and Chinese President Xi Jinping. That plan, slated to include concrete deliverables that could be implemented by July 16 to boost U.S. exports and reduce the bilateral trade deficit, has been under negotiation between Commerce Secretary Wilbur Ross, Treasury Secretary Steven Mnuchin and Chinese Vice Premier Wang Yang. Though the final outcomes address a handful of issues in areas such as agriculture, biotechnology, natural gas and financial services as well as positive language on Chinese investment and programs, most of these merely update previous deliverables. Moreover, none of the interim results focus on core manufacturing issues, such as those the NAM raised in its submission to the trade deficit review, though the release notes that the two sides also discussed more challenging issues that could include manufacturing concerns. The NAM will be closely monitoring for other deliverables announced by July 16 as well as additional plans, such as a possible one-year plan of concrete actions to promote economic engagement set to follow the initial 100-day period and the first meeting of the Comprehensive Economic Dialogue to be led by Secretaries Mnuchin and Ross later this summer. For more information on the NAM’s work on China, contact NAM Director of International Business Policy Ryan Ong. NAM-led coalition presses Congress, administration on global institution activities that harm U.S. competitiveness and jobs, releases polling data showing voter mandate. Contact Jeffrey Odum for more information. Application deadline is September 1. Click here for a general flyer about the mission and forum, and contact Diego Gattesco for more information. Application deadline is August 18. Contact Ethel Glen for more information. Application deadline is July 28.